Today's obstetrician gynecologist is required to interpret and in many cases perform ultrasound scans in the first trimester. In fact, certification of residency programs in many countries requires documentation of adequate exposure to and training in the evaluation of first-trimester ultrasound. Failure to understand the limitations of diagnostic ultrasound or inadequate training of physicians in this technique can result in grave complications for the patient and liability for health-care providers. Correct dating of gestational age since 10–15% of women will have inaccurate assignment of gestational age of more than 1 week based on menstrual history. Identification of missed abortion, ectopic pregnancy, and C-section scar pregnancies. 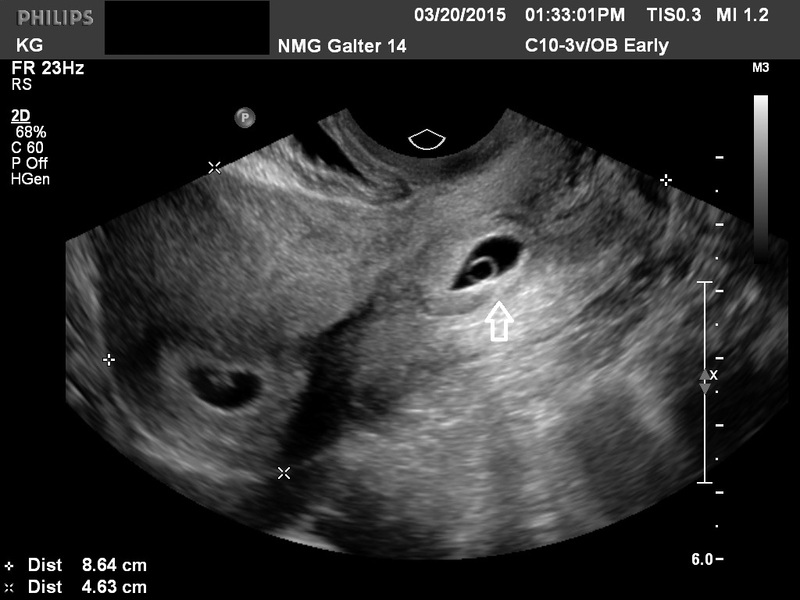 Early identification of multiple gestation and correct determination of chorionicity. The standard of care for performing routine ultrasound examination at 6–7 weeks varies from country to country. The disadvantages of performing this examination routinely are related to cost, errors in diagnosing ectopic pregnancies that in fact are intrauterine, increased training requirements for providers, and potential biologic hazards to the fetus that are presently unknown. Early diagnosis of certain severe and lethal anomalies. 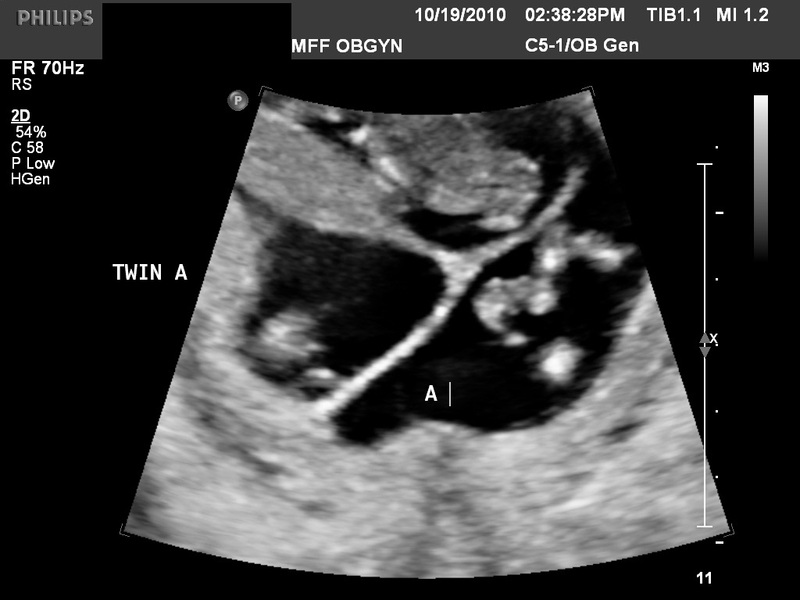 Early diagnosis of major trisomies as part of nuchal screening. Early identification of C-section scar pregnancy. Similarly the standard of care for performing routine ultrasound at 12–14 weeks' gestation from the LMP varies from country to country. The disadvantages are cost, decreased sensitivity for major anomalies compared to the 20 week exam, and marked increase in training requirements for providers. The role of the early anatomic survey, when free DNA screening for chromosomal anomalies is being utilized, remains to be determined. 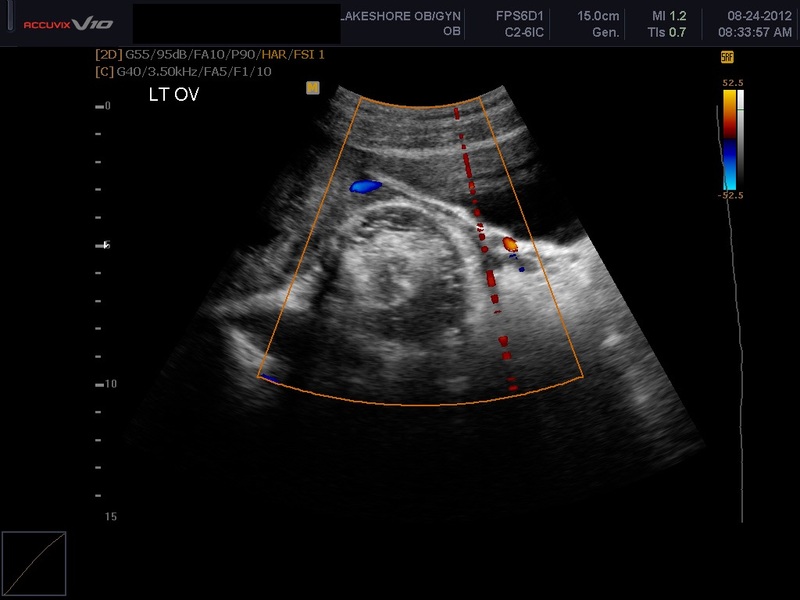 Any health-care provider performing diagnostic ultrasound must understand the physics of diagnostic ultrasound and have thorough, supervised training. This includes, but is not limited to, power settings, basic orientation, and proper cleaning of ultrasound probes between uses. For United States readers, the website, aium.org, of the American Institute of Ultrasound in Medicine will be helpful for guidelines. Alternatively for international readers, the website, isuog.org, of The International Society of Ultrasound in Obstetrics and Gynecology should be searched for similar guidelines. Warren and associates described the orderly appearance of gestational sac, yolk sac, and embryo with heartbeat at a given number of days from the onset of the last menstrual period (Table 1).1 With a transvaginal probe, a 2- to 3-mm gestational sac can usually be seen by 5 weeks from the last menstrual period (Fig 1A). A yolk sac is usually seen by 6 menstrual weeks, or by the time the mean diameter of the sac has reached 10 mm (Fig 1B and Fig 1C). 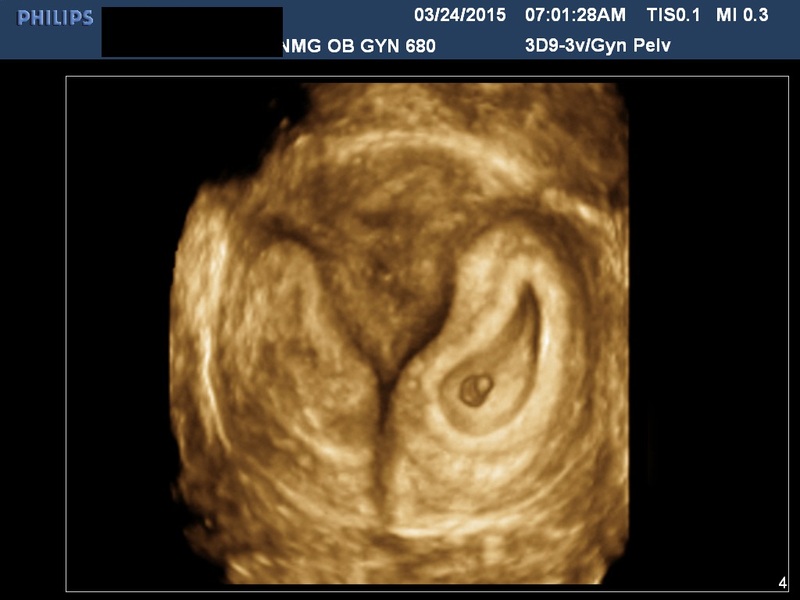 A fetal pole with heart tones is typically seen by the completion of 7 menstrual weeks (Fig 1D). As shown by Fossum and colleagues, the appearance of these structures can be correlated with β-human chorionic gonadotropin (β-hCG) levels (Table 2).2 The literature regarding the correlation between quantitative β-hCG titers and early intrauterine gestational sacs and embryonic structures has been made somewhat confusing by the array of reference standards used to quantify β-hCG. Suffice it to say that the presently used Third International Standard and Fourth International Standard, used by most companies marketing β-hCG kits, corresponds roughly to the First International Reference Preparation. The practitioner must understand that these β-hCG levels are guidelines for the appearance of these structures and are not 100% reliable or accurate. This is discussed subsequently. The generally accepted β-hCG discriminatory zone of 2000mIU/ml for the appearance of an intrauterine gestational sac is not 100% reliable. Recent papers by Doubilet and Benson and Ko and Cheung have provided examples of women with titers greater than 2000 mIU/ml, where transvaginal ultrasound did not identify a early intrauterine sac, and a subsequent ultrasound confirmed a viable pregnancy.3, 4 The β-hCG cut-offs for visualizing a intrauterine pregnancy sac, a yolk sac, and a fetus with heartbeat are guidelines. These cut-offs are accurate in a high percentage of patients with singleton pregnancies, but are subject to biologic as well single test error. These outliers are not limited to multiple gestations. 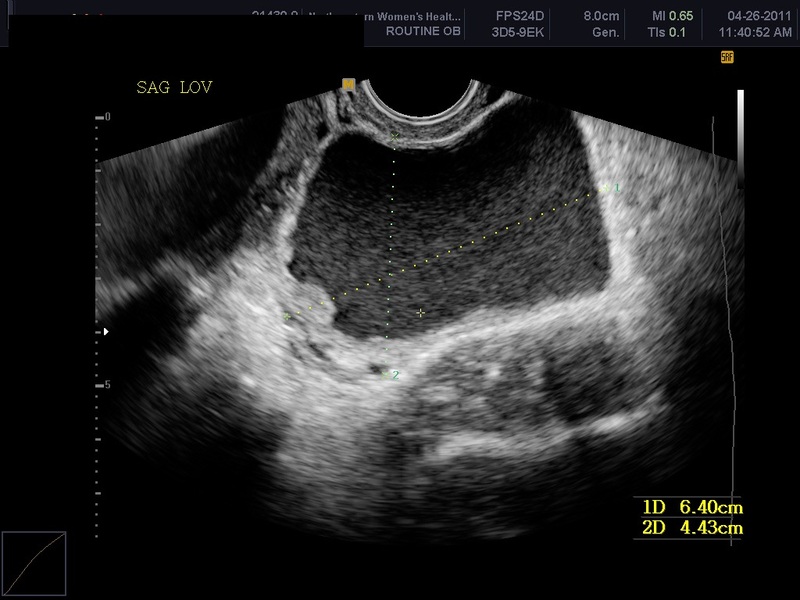 In the series by Doubilet and Benson using transvaginal ultrasound , non-visualization of a early intrauterine pregnancy sac, was seen with a β-hCG level as high as 6567 mIU/ml. These exceptions to the previously accepted cut-offs have important implications in the management of threatened abortion, missed abortion, and ectopic pregnancy. Considerable caution must be exercised not to mistake collections of fluid within the endometrial cavity for early gestational sacs. 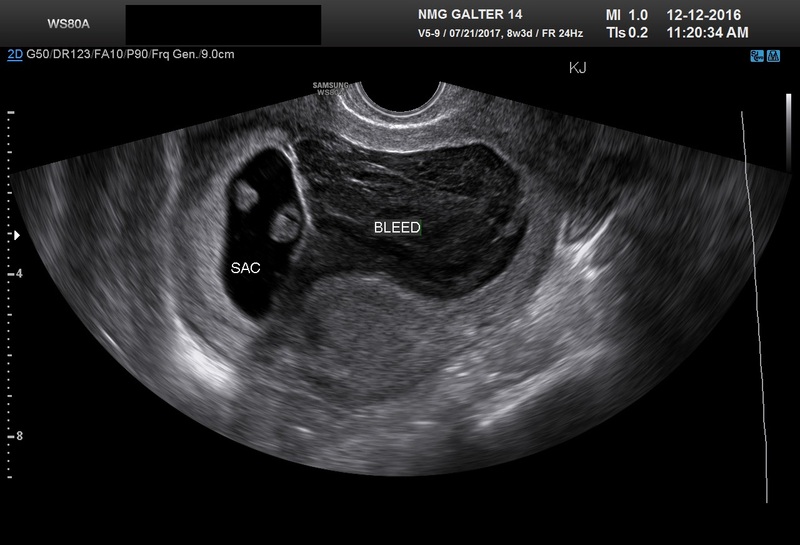 These “pseudogestational sacs” can lead to a missed diagnosis of ectopic pregnancy (Figures 2A–2D). 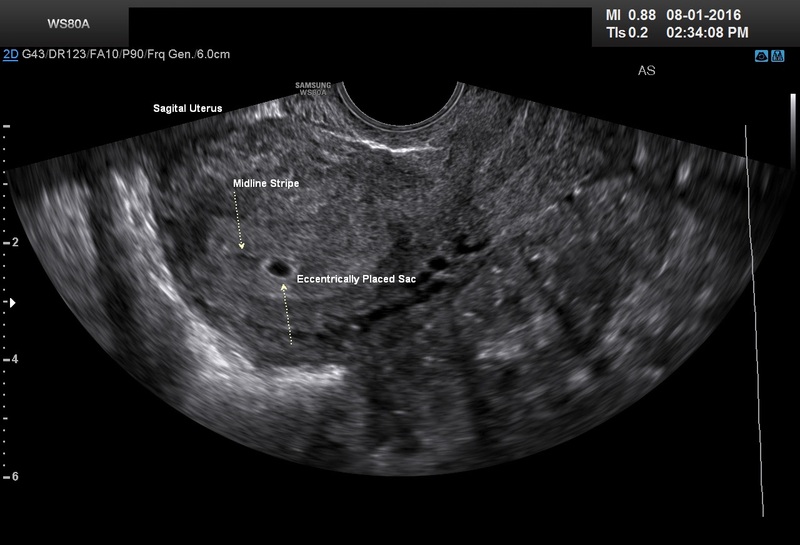 Normal early gestational sacs are seen eccentrically placed in the decidua, adjacent to the echogenic central stripe (Figure 1A). This finding is called the intradecidual sign. A review of the literature by Richardson et al., from 2015, found the intradecidual sign was 66% sensitive and 100% specific in identifying an intrauterine pregnancy. The double decidual ring sign was 82% sensitive and 97% specific. Confidence intervals for the reviewed studies were not ideal because of the size of the studies.5 A new study from 2016 by Richardson et al. 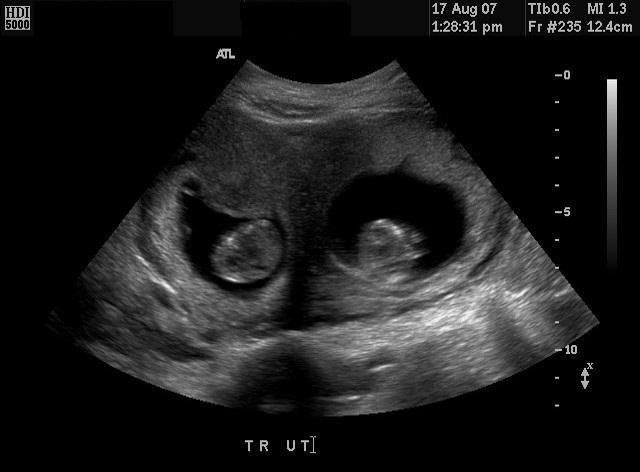 using high resolution ultrasound found a diagnostic sensitivity of 94% and 100% specificity for the double decidual ring in identifying an intrauterine pregnancy.6 Benson and Doubilet have found that in comparison to early circular intrauterine sacs, pseudo-sacs elongate on the sagittal view.7 Their finding is very useful in differentiating early pregnancy sacs from intracavitary fluid. 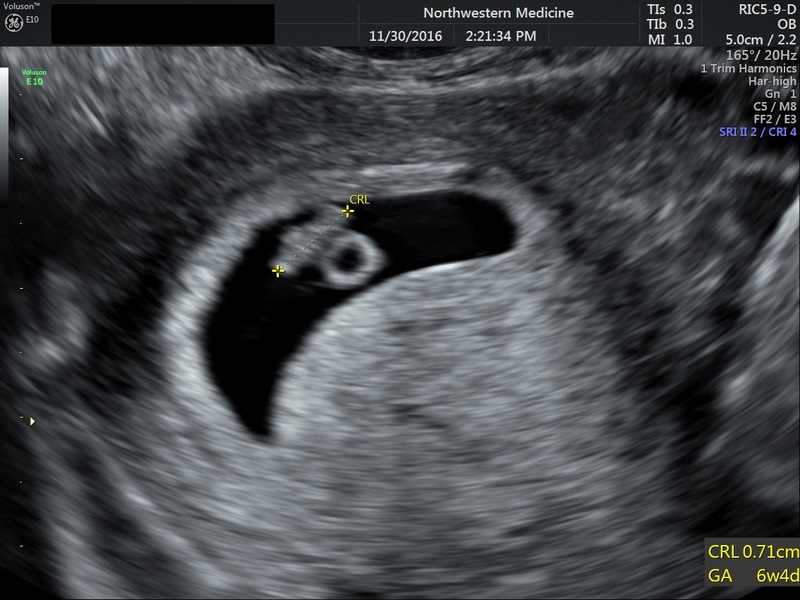 Our lab at Northwestern relies very heavily on the intradecidual sign and the appearance of the sac on the sagittal view to differentiate very early pregnancy sacs from pseudosacs. 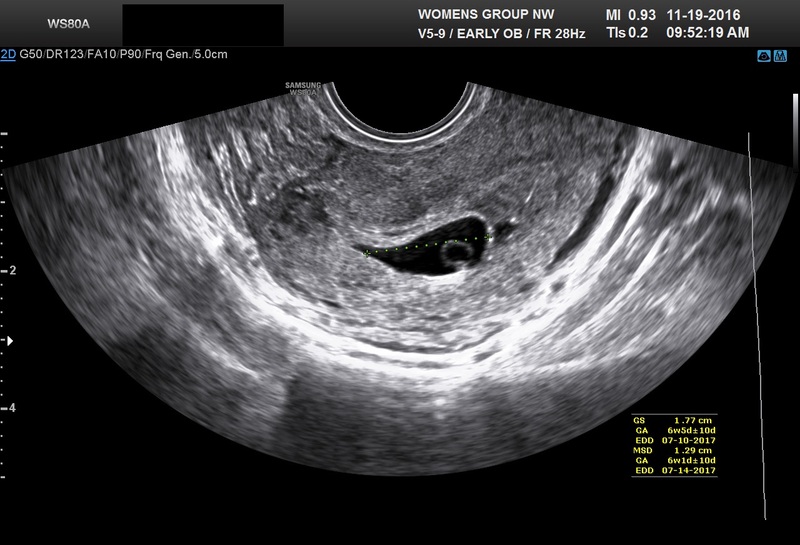 We also rescan the patient in 7–10 days to document the appearance of the yolk sac. In the first 8 weeks of pregnancy, the corpus luteum is often identified as a cystic mass measuring 1–3 cm in diameter (Fig 3), although they may reach as large as 8 cm.8 The corpus luteum usually resolves spontaneously and is typically not seen by the onset of the second trimester. They can contain areas of complex echogenicity that may masquerade as a neoplasm or an ectopic pregnancy. Consultation with specialists should be obtained if an adnexal mass persists into the second trimester. 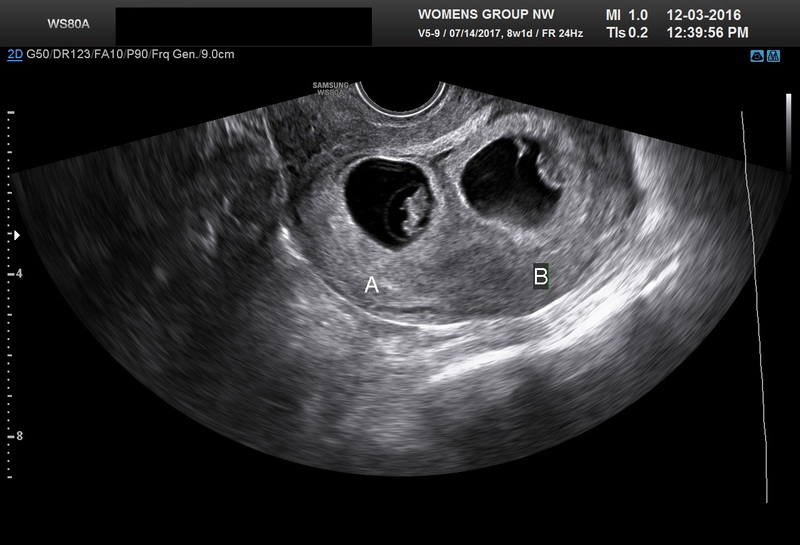 The two most common persistent ovarian masses that are seen in the second trimester are endometriomas (Fig 4A) and cystic teratomas (Fig 5). Endometriomas and cystic teratomas usually do not require surgical intervention during pregnancy. The increasing accuracy of ultrasound supplemented by MRI in correctly predicting endometriomas, cystic teratomas, and adenofibromas/fibromas has led to a marked decreased in surgical interventions for adnexal masses during pregnancy (unpublished data). Torsion of an adnexal mass is the most common cause for surgery for an adnexal mass during pregnancy at our institution. The role of color Doppler velocimetry in ruling out torsion is problematic. 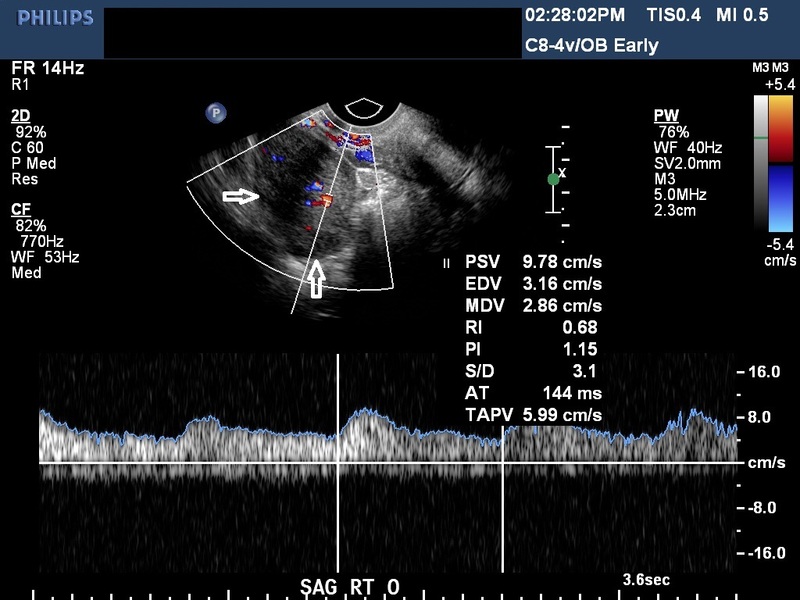 In some cases both arterial and venous flow may be preserved on pulsed color Doppler (Fig 6). The need for surgical intervention in these cases is based on clinical findings and judgement. The risk of a persistent adnexal mass during pregnancy subsequently diagnosed as borderline or malignant has been estimated to be approximately 1–3% (Fig 7).9, 10 The published studies are retrospective and may be subject to ascertainment bias due to cases referred to major academic medical centers. 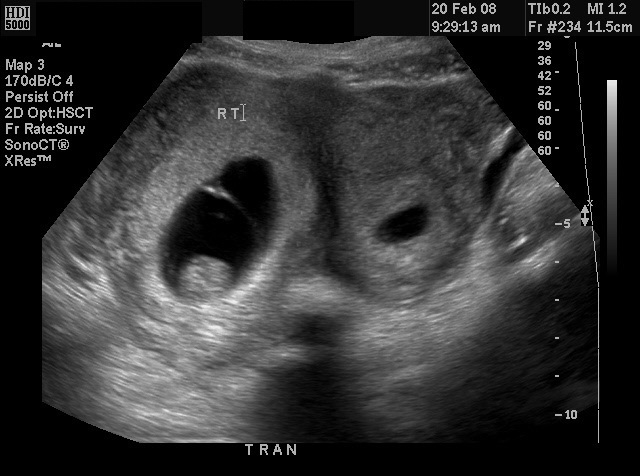 Decidualized endometriomas can easily be confused with malignant ovarian neoplasms (Fig 4B−D).11 The ultrasound features which can be used to try to distinguish decidualized endometriomas from malignant ovarian cysts have been reviewed by Mascillini et al.12 MRI can be particularly useful in identifying a complex mass as a cystic teratoma, endometrioma, or fibroma. MRI may also be useful in differentiating benign from malignant ovarian/adnexal pathology. This subject has been well reviewed by Yacobozzi.13 The role of MRI with gadolinium contrast during pregnancy is subject to debate. In some countries its use is allowed after the first trimester. In the United States MRI with gadolinium it is considered contraindicated throughout pregnancy. Two papers by Doubilet and Benson in 2010 and Abdallah et al. both in 2011 recommended that using previous guidelines for diagnosing missed abortion could result in inadvertent termination of pregnancy in a small percentage of women with suspect missed abortion.17, 18, The previous guidelines from the earlier version of this chapter are given below. For patients who appear not to believe the diagnosis of pregnancy loss, a repeat scan at an appropriate interval may be indicated. Many patients expect that TVS will be performed. Both they and their physicians may be uncomfortable if the diagnosis of early pregnancy loss is not confirmed by this technique. In addition a full bladder is not required for TVS. The majority of patients are more comfortable being scanned transvaginally with an empty bladder. Furthermore, anesthesiologists prefer that patients do not have full stomachs from drinking large volumes of fluid. A new standard in the United States was reached at a multispecialty conference sponsored by the Society of Radiologists in Ultrasound. It was summarized and published in the New England Journal in 2013 by Doubilet et al.22, The guidelines listed above have been changed as follows. 1a. 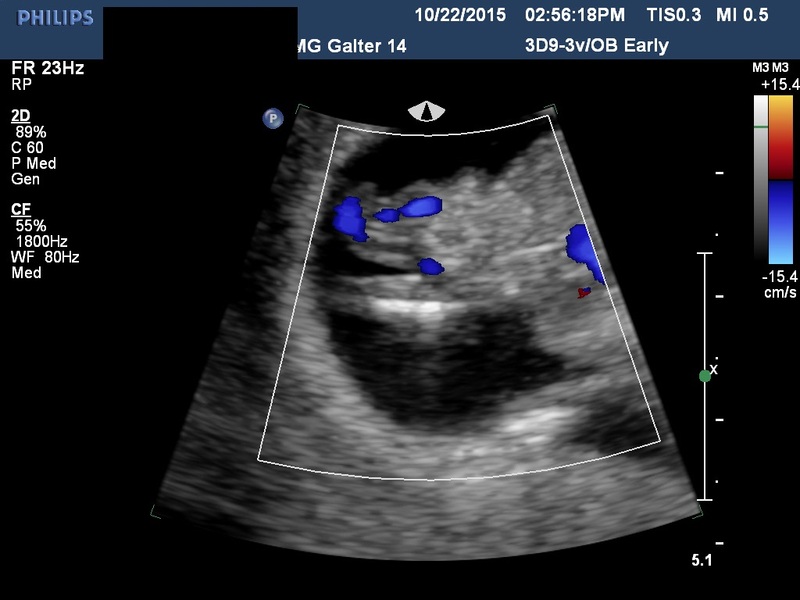 Absence of embryo with heartbeat >2 weeks after gestational sac visualized without a yolk sac. 1b. 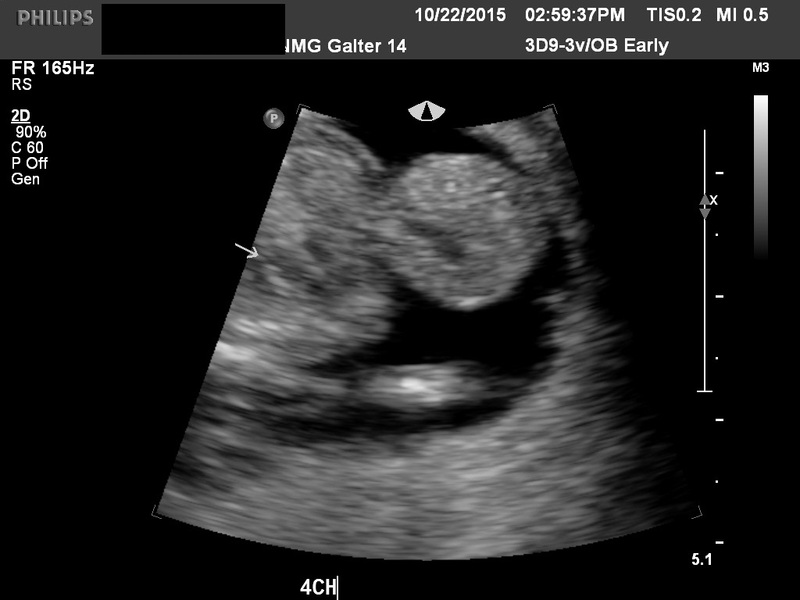 Absence of a embryo with a heartbeat >11 days after a gestational sac visualized with a yolk sac. 2. 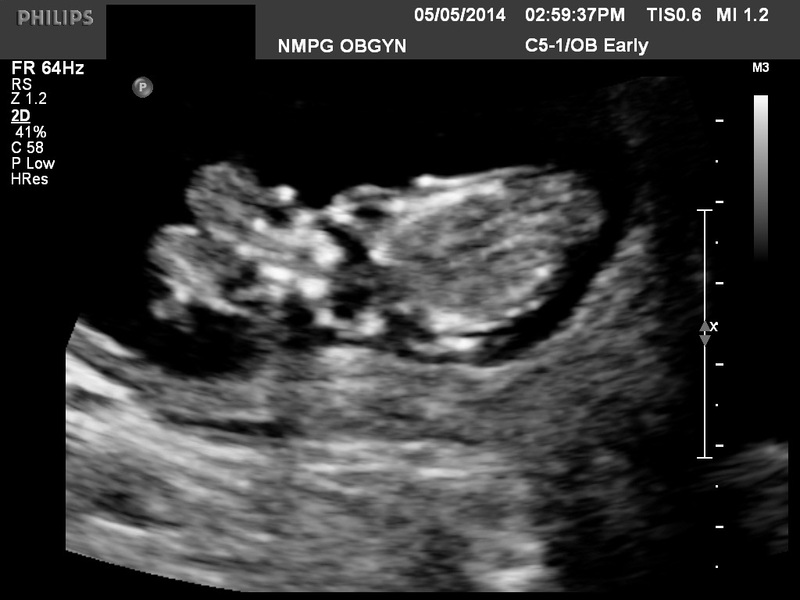 The CRL is >7 mm and fetal heart tones are absent. 3. 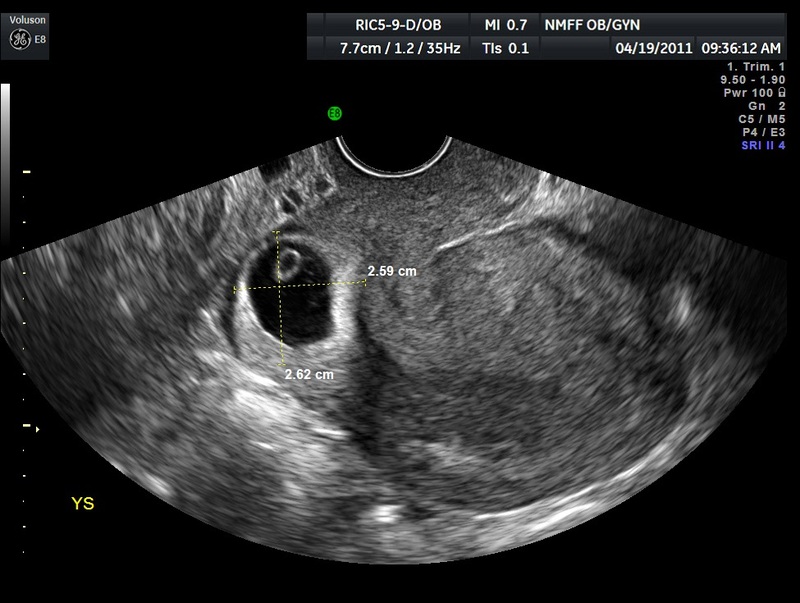 The mean sac diameter is >25 mm and no embryo is seen. The older guidelines #1, #2, and #3 above are now considered suspicious but not diagnostic for a missed abortion. Statistical analysis by Jeve et al. in 2011 of the older guidelines revealed a confidence interval of 90–100% for the specificity.23 Most ultrasound labs using the older guidelines had already modified their practice by rescanning 7–10 days after a missed abortion was diagnosed by old guidelines #2 and #3. The new guidelines are meant to be 100% specific with a positive predictive value as close as possible to 100% for predicting missed abortion. Expectant management or pharmacologic methods can be used to treat early missed abortions in 80–90% of patients without dilation and curettage (D and C) being required. Cowett et al. 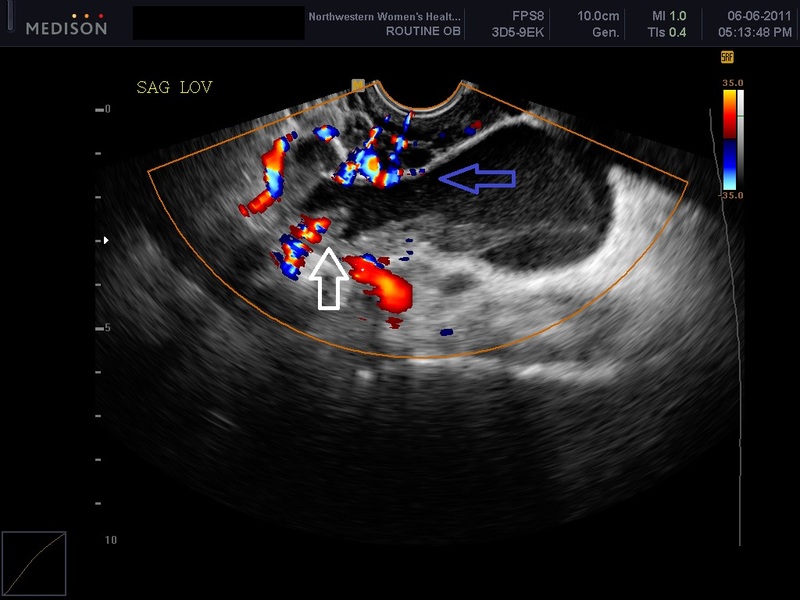 have reported that unless the patient has excessive bleeding or other compelling symptoms, the absence of a gestational sac after medical abortion, demonstrates that a dilation and curettage will not be required.25 Small amounts of clot, fragments of tissue, and small regions of color Doppler flow at the implantation site can be usually be managed expectantly. Suspected endometritis or subinvolution of the placental site may require antibiotic or cytotec. Rarely patients will have persistent benign trophoblast. On Doppler these patients will have extension deep into the myometrium. Two examples are given in Figures 11A and 11B. Fig 11A and B Persistent benign trophoblast is likely in both of these cases. Both patients had presented with bleeding at 7–8 weeks with intrauterine pregnancy sacs and missed abortion was confirmed. Both were treated with cytotec. We recommend transvaginal scan be performed 1 week after cytotec to document completed abortion or sooner if there is excessive bleeding. 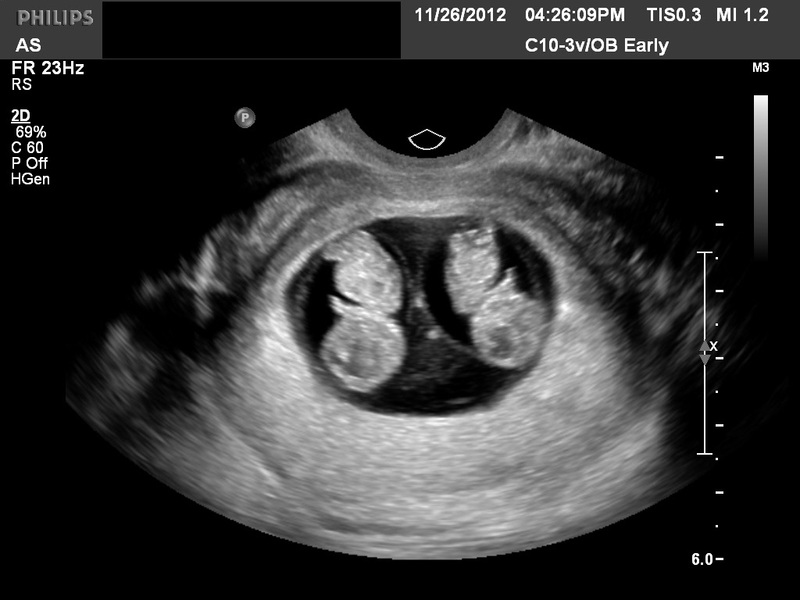 The gestational sacs are no longer seen in these two examples. However, areas of markedly increased color Doppler are noted in the myometrium fundally. Both patients had persistent bleeding and β-hCG levels that were not falling properly. Management of these cases varies between practitioners and institutions. Careful D and C under ultrasound guidance gives a histologic diagnosis. However, methotrexate may still be required if β-hCG levels fail to become negative. This can be seen even when benign trophoblast is found on pathology. Alternatively, the patient may be treated initially with methotrexate. This requires that the pretreatment ultrasound shows no evidence of molar tissue or marked hydropic change. 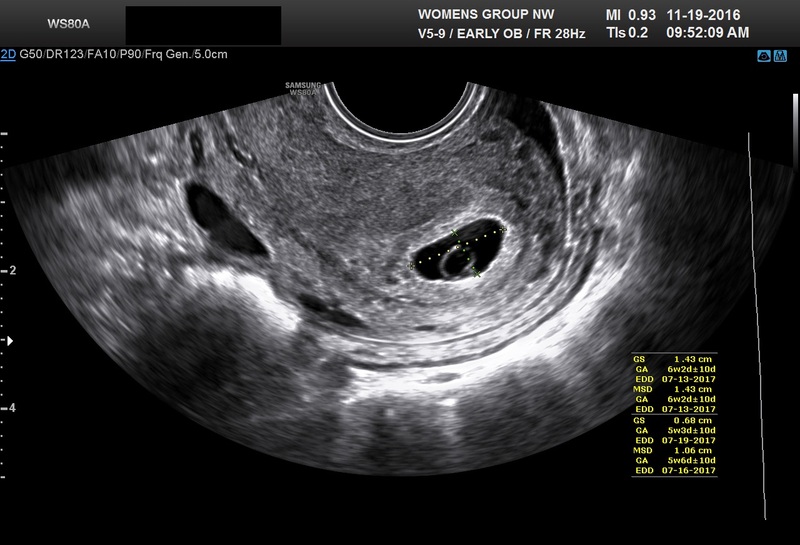 A previous ultrasound documented an intrauterine pregnancy, and the endometrial cavity is now empty. Products of conception have been identified pathologically, and the uterine cavity appears empty. Quantitative titers are heading toward zero at an appropriate rate, and the uterine cavity appears empty. This may also be consistent with a nonviable ectopic or tubal abortion. The incidence of ectopic pregnancy has now reached nearly 2%. Any patient with a history of ectopic pregnancy, tubal ligation or tubal surgery, or pelvic inflammatory disease should undergo TVS by 6 weeks from the last menstrual period (LMP). For patients who are not at high risk for ectopic pregnancy, the two most common presenting symptoms are bleeding and pelvic pain. The pain is typically lateralized over the adnexa. In a 1981 study, Kadar and associates found that a “discriminatory” β-hCG value of 6000 mIU/ml could be used as a cut-off for when an intrauterine gestational sac should be seen via TAS.27 With the availability of TVS in the late 1980s, many publications found that an early gestational sac was typically seen at a β-hCG level of 1500–2000 mIU/ml (Third International Standard). The normal doubling time for β-hCG levels in early gestation was felt to be every 48–72 hours. In the presence of slowly rising or plateauing β-hCG titers and nonvisualization of an intrauterine gestational sac, the patient can be diagnosed with an early intrauterine pregnancy loss or ectopic pregnancy. Examples of various locations for ectopic pregnancy are given Figures 12–17. Although the pros and cons of the medical management of ectopic pregnancy with methotrexate are beyond the scope of this chapter, two points are worth making. First, LMP dating is off by at least 1 week 15% of the time. Failure to check serial titers can result in improper administration of methotrexate to patients with healthy pregnancies. Litigation has occurred in cases where methotrexate was inadvertently given to patients subsequently found to have an early intrauterine pregnancy. Second, methotrexate therapy for proven ectopic pregnancies appears to work best if the ectopic adnexal mass is less than 4 cm and the β-hCG titer less than 5000 mIU/ml. The reader is referred to the excellent paper by Lipscomb in the New England Journal of Medicine.35 Pregnancies that do not meet these criteria are more likely either to require multiple doses of methotrexate or to be unresponsive to treatment. 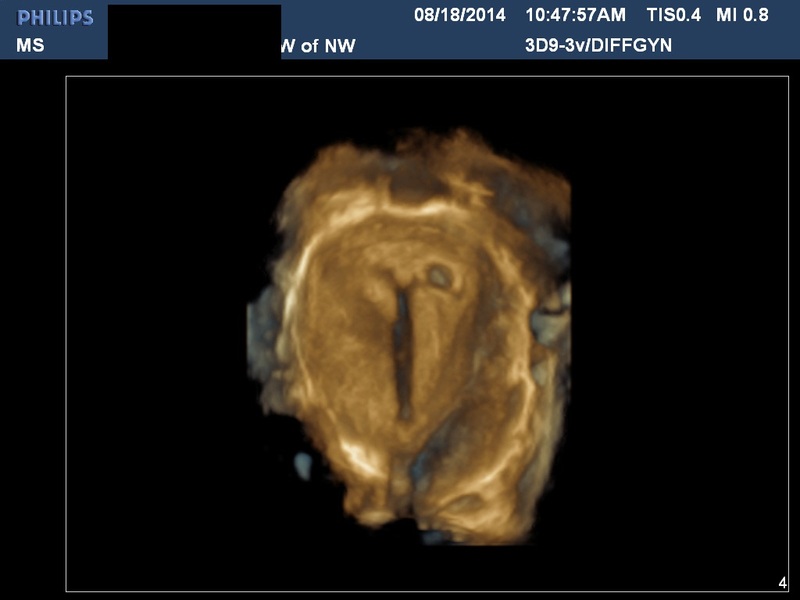 A typical 9 week CRL is shown in Figure 18. A typical 7 week CRL is shown in Figure 1D. 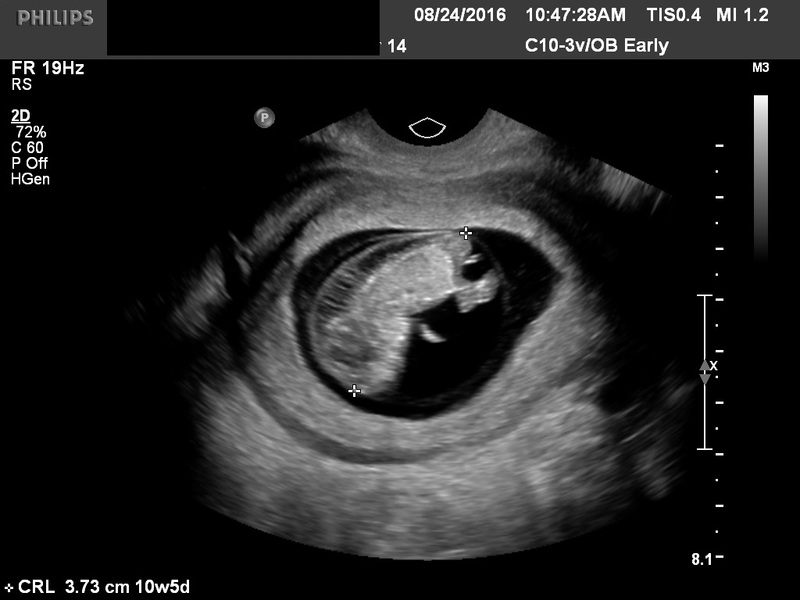 Fig 18 A 9 week CRL. Please note the fetus may start to curl and may be undermeasured. The amnion is now well seen. Examples of abnormal nuchals are given in Figures 21, 22 and 23. 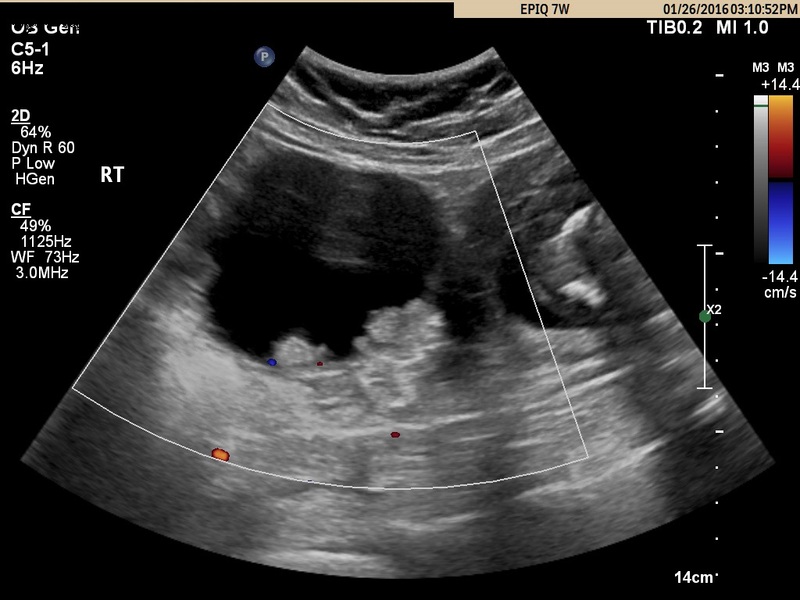 Fig 27 A fetus with acrania and pericardial effusion. 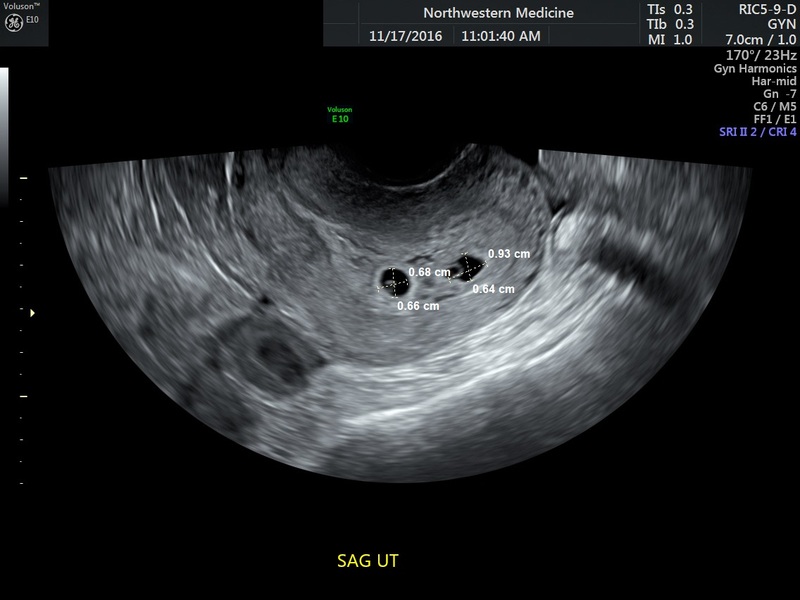 Major uterine anomalies are not infrequently diagnosed during the first-trimester ultrasound examination. The bicornuate uterus is characterized by its widened transverse diameter and a notched fundus. The septated uterus has a normal uterine contour but a septated endometrial cavity. Three-dimensional imaging has markedly simplified the detection and classification of suspect uterine anomalies. Doubilet PM and Benson CB: Further evidence against the reliability of human chorionic gonadotropin discriminatory level. 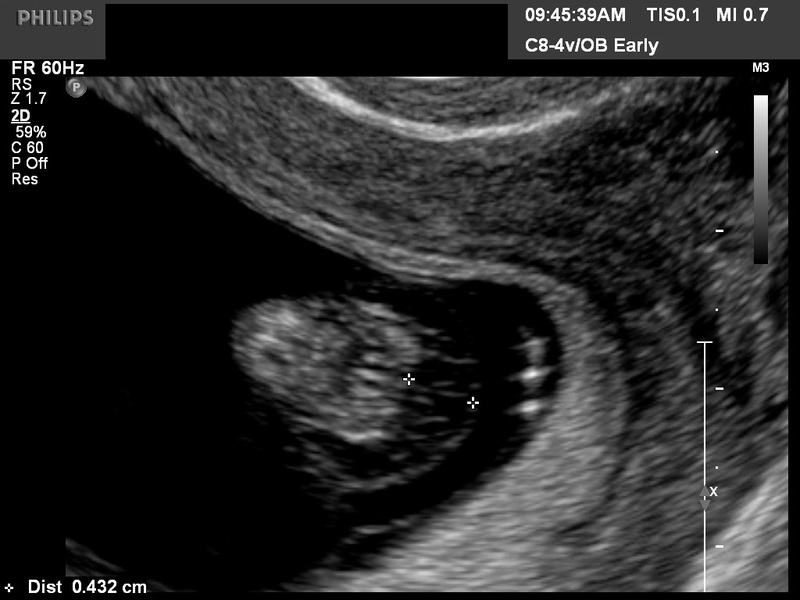 J Ultrasound Med 2011; 30:1637-1642. Ko J, Cheung V. Time to revisit the human chorionic gonadotropin discriminatory level in the management of pregnancy of unknown location. J Ultrasound Med 2014;33:465-471. Richardson A, Gallos I, Dobson S et al. 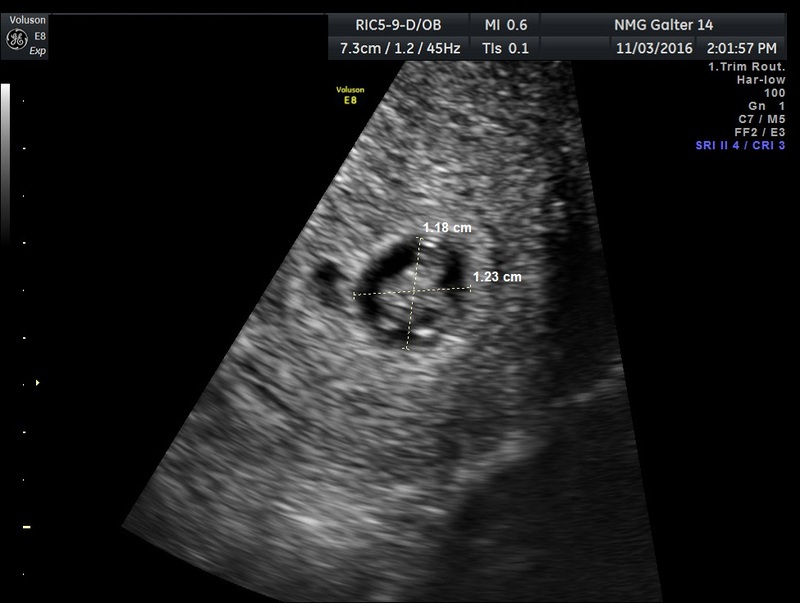 Accuracy of first trimester ultrasound in diagnosis of intrauterine pregnancy prior to visualization of the yolk sac: a systematic review and meta-analysis. 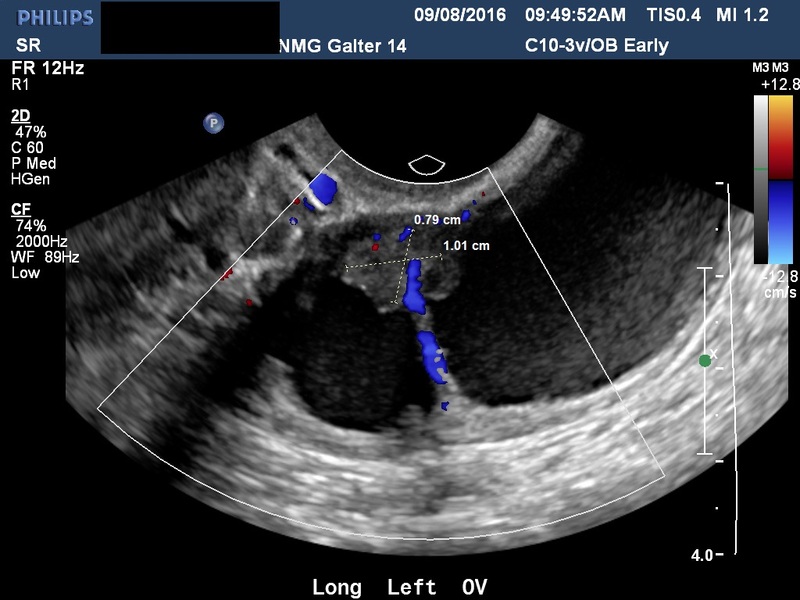 Ultrasound Obstet Gynecol 2015; 46:142-149..
Benson CB , Doubilet PM, Peters HE, and Frates MC:Intrauterine fluid with ectopic pregnancy. J Ultrasound Med 2013; 32:389-393. 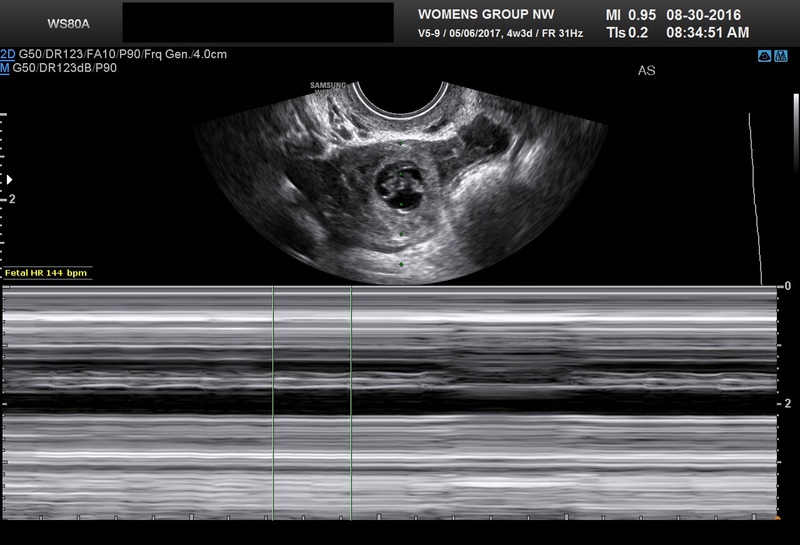 Perkins KY, Johnson JL, Kay Helen HK: Simple ovarian cysts: Clinical features on first trimester ultrasound. J Reprod Med 1997; 42: 440-444. Bromley B, Benacerraf B: Adnexal masses during pregnancy: Accuracy of sonographic diagnosis. J Ultrasound Med 1997; 16: 447-452..
Chiang G and Levine D. Imaging of adnexal masses in pregnancy. J Ultrasound Med 2004; 23:805-819. Barbieri M, Somigliana E, Oneida S et al. 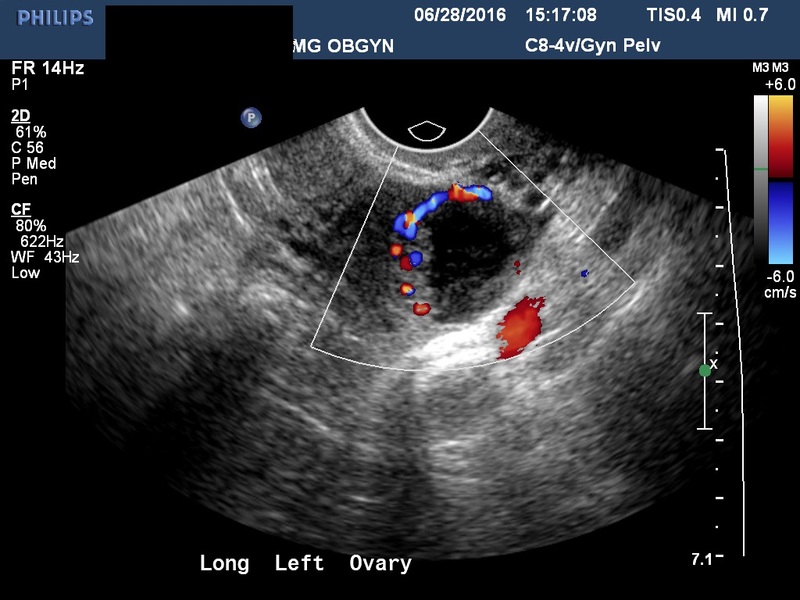 Decidualized ovarian endometriosis in pregnancy : a challenging diagnostic entity. Human Reproduction 2009; 24:1818-1824. Yacobozzi M, Nguyen D, Rakita D. Adnexal Masses in Pregnancy. Sem Ultrasound CT MR 2012; 33:55-64. Ball RH, Ade CM, Schoenborn JA, Crane J: The clinical significance of ultrasonographically detected subchorionic hemorrhages. Am J Obstet Gynecol 1966;174: 996-1002. Tuuli MG, Norman SM, Odibo AO, Macones GA, Cahill AG.Perinatal outcomes in women with subchorionic hematoma: a systematic review and meta-analysis. Obstet Gynecol 2011;117:1205-1212. Tan S, Tangal NG,Kanat-Pektas M et al. 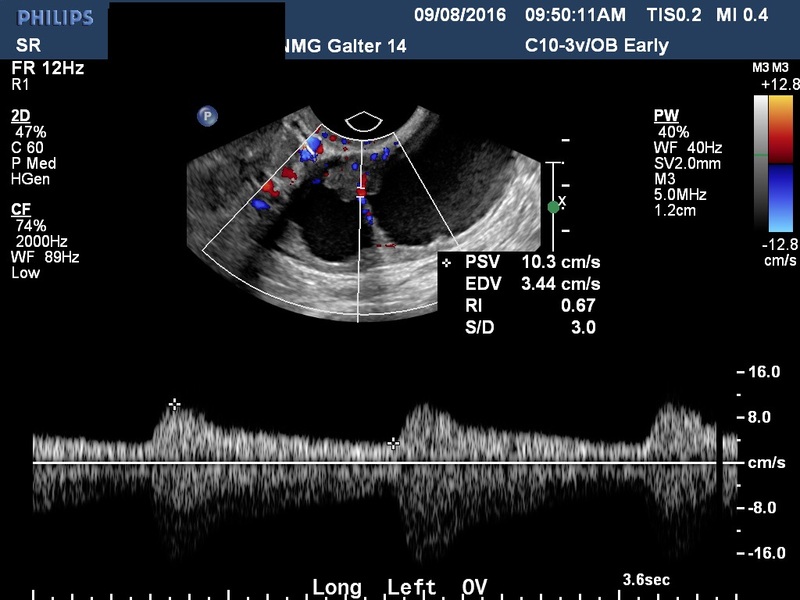 Abnormal sonographic appearances of the yolk sac: which can be associated with adverse perinatal outcome? Medical Ultrasound 16:15-20,2014. Doubilet PM, Benson CB. First do no harm… too early pregnancies. J Ultrasound Med 2010; 29:685-689. Abdallah Y, Daemen A, Kirk et al. Limitations of the current definitions of miscarriage using mean gestational sac diameter and crown-rump length measurements: a multicenter observational study. Obstet Gynecol 2011; 38:497-452. Pennell RG, Needleman L, Pajak T et al: Prospective comparison of vaginal and abdominal ultrasound in normal early pregnancy. J Ultrasound Med 1991; 10: 63-67. 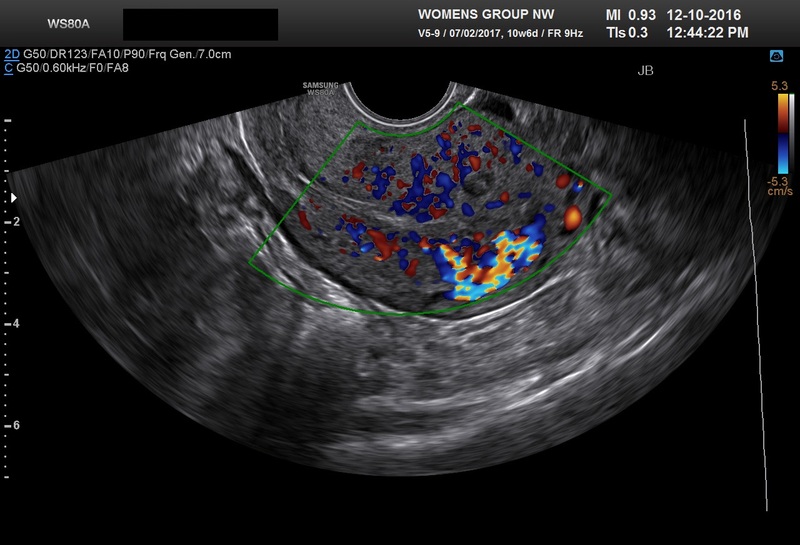 Falco P, Milano V, Pilu G et al: Sonography of pregnancies in with first trimester bleeding and a viable embryo: A study of prognostic indicators by logistic regression. Ultrasound Obstet Gynecol 1996; 7: 165-169. 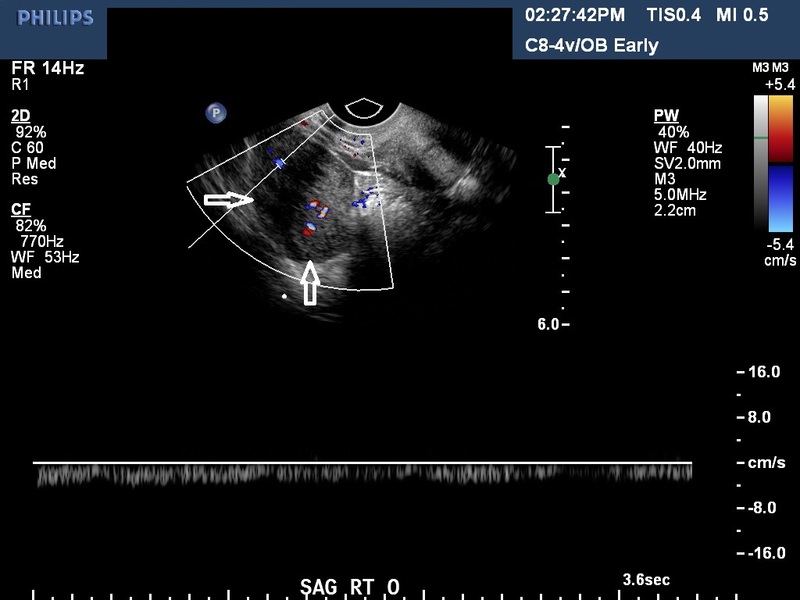 Goldstein I, Zimmer EA, Tamir A et al: Evaluation of normal gestational sac growth: Appearance of embryonic heartbeat and embryo movements using transvaginal technique. Obstet Gynecol 1991; 77: 885-888. 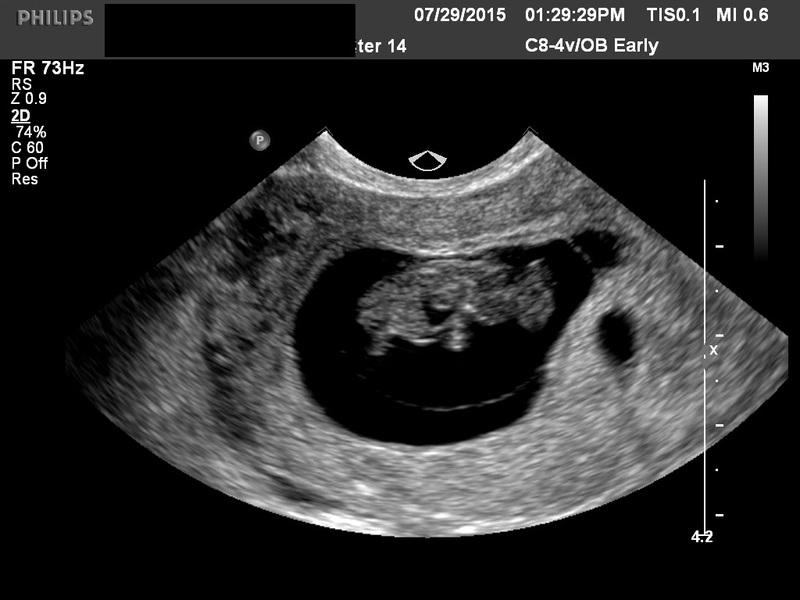 Doubilet PM, Benson CB, Bourne T, Blaivas M. Diagnostic Criteria for nonviable pregnancy early in the first trimester. New England Journal 2013; 369:1443-1446. 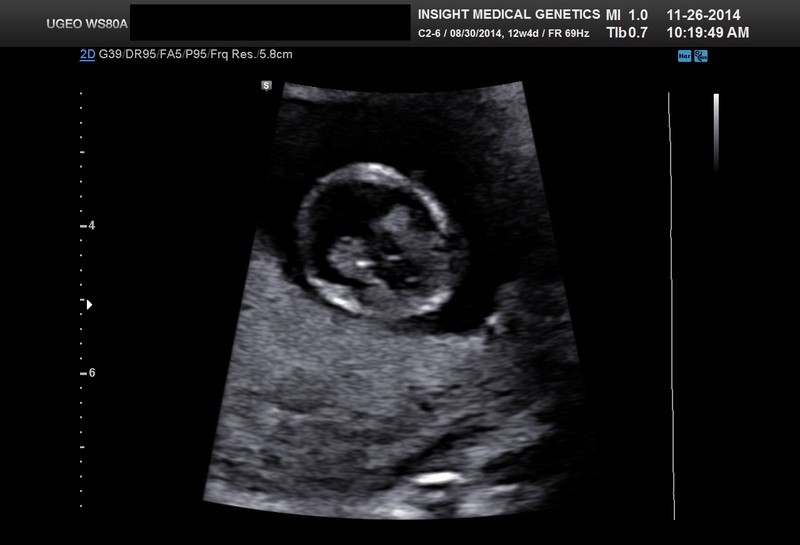 Jeve Y, Rana R, Bhide A, Thangaratinam S. Accuracy of first trimester ultrasound in the diagnosis of early embryonic demise: a systematic review. 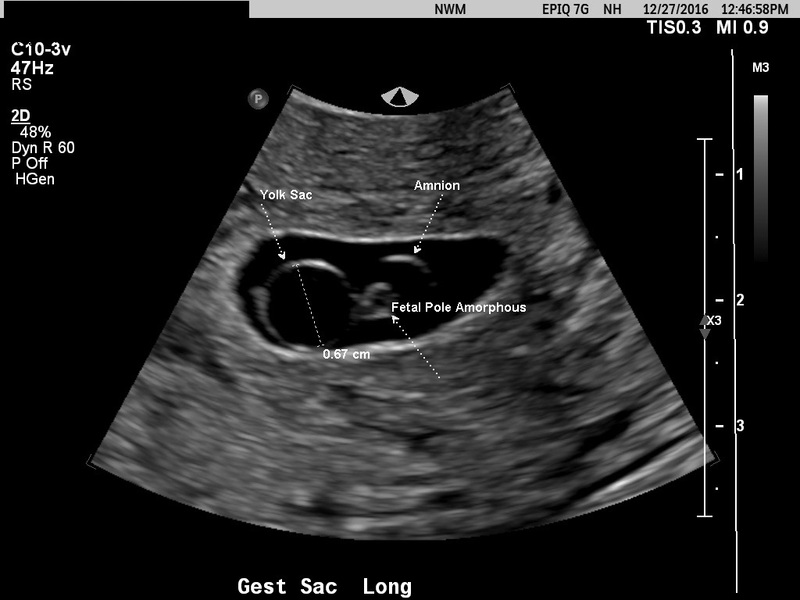 Ultrasound Obstet Gynecol 2011;38:489-496,2011. Rulin MC, Bornstein SG, Campbell JD: The reliability of ultrasonography in the management of spontaneous abortion thought to be complete: A prospective study. Am J Obstet Gynecol 1993;168: 12-15. Cowett AA, CohenLS, Lichtenberg ES, Stika CS. 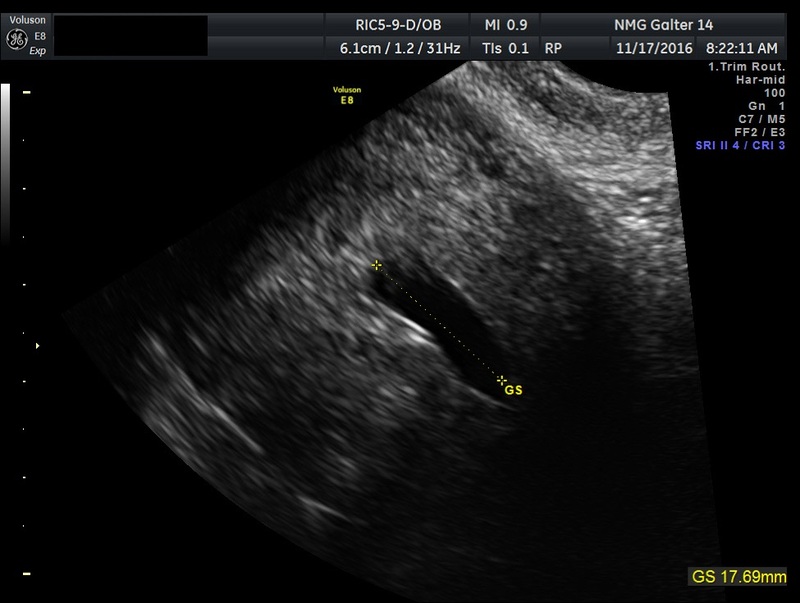 Ultrasound evaluation of the endometrium after medical termination of pregnancy. Obstet Gynecol 2004; 103:871-875. Tal J, Haddad S, Gordon N, Timor-Tritsch I: Heterotopic pregnancy after ovulation induction and assisted reproduction and assisted reproductive technology: A literature review from 1971–1993. Fertil Steril 1996: 66: 1-12. 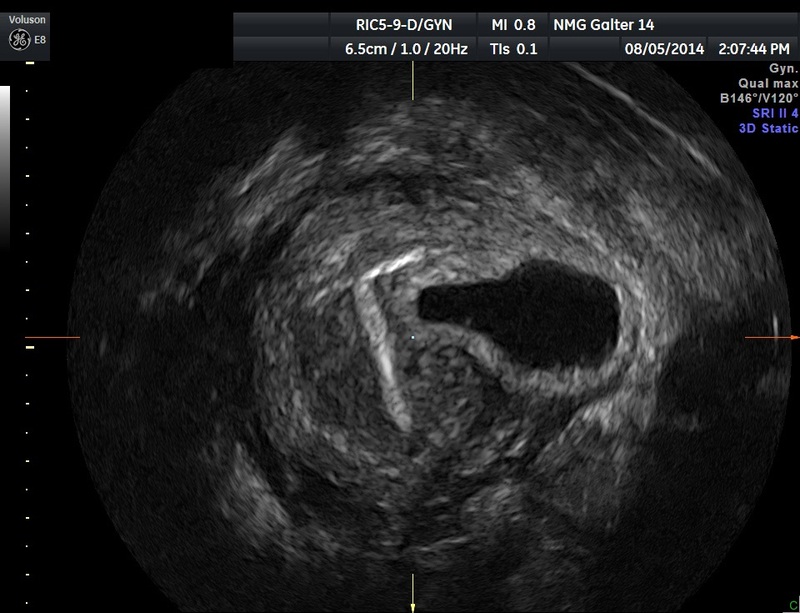 Kadar N, Devore G, Romero R: Discriminatory beta-hCG zone: Its use in the sonographic evaluation of ectopic pregnancy. Obstet Gynecol 1981; 58: 156-161. Condous G, Van Calster B, Kirk E et al. 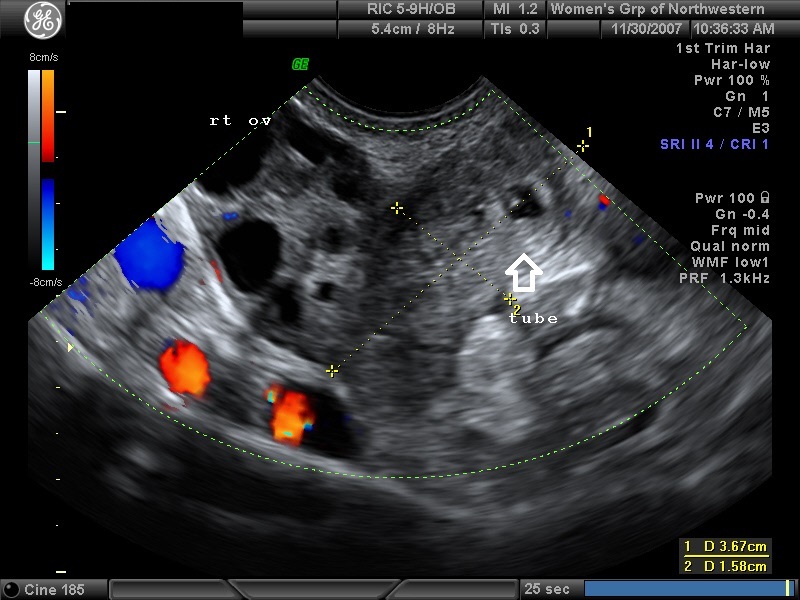 Prediction of ectopic pregnancy in women with a pregnancy of unknown location. 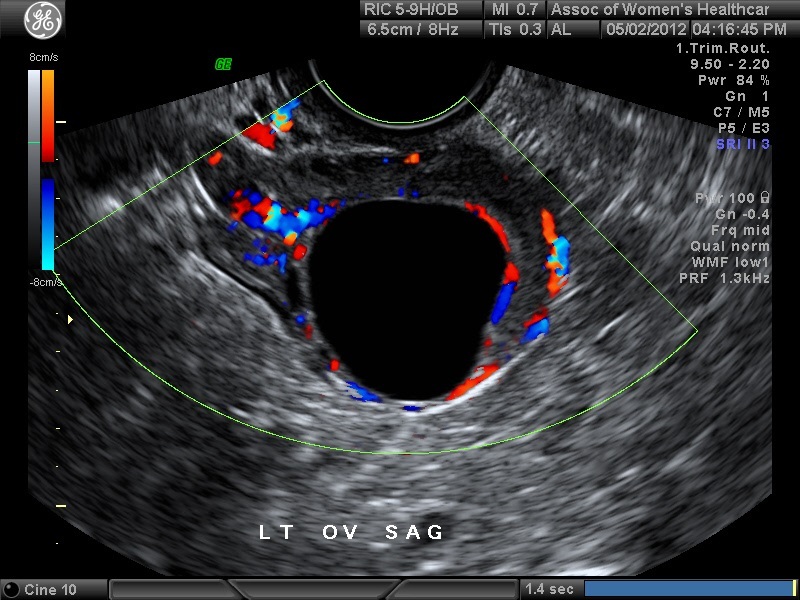 Ultrasound Obstet Gynecol 2007; 29: 680-687. Barnhart KT, Samuel MD, Rinaudo PF et al. Symptomatic patients with early viable intrauterine pregnancy:HCG curves redefined. Obstet Gynecol 2004; 104:50-55. Stovall TG, Ling FW, Gray LA: Single dose methotrexate for the treatment of ectopic pregnancy. Obstet Gynecol 1991;77: 754-777. Timor-Tritsch IE, Yeh MN, Peisner DB et al: The use of transvaginal ultrasound in the diagnosis of ectopic pregnancy. Am J Obstet Gynecol 1989; 161: 157-161. Practice Committee of Society of Reproductive Medicine .Medical Treatment of Ectopic Pregnancy: A Committee Opinion. Fertility Sterility 2013;100:638-644. Marret H, Fauconnier A, Dubemard G, et al. Overview of guidelines of off-label use of methotrexate in ectopic pregnancy: report of CNGOF. Eur J Obstet Gynecol Reprod Bio 2016;205:105-109. Lipscomb GH, McCord ML, Stovall TG et al. Predictors of methotrexate treatment in women with tubal ectopic pregnancy. N Engl J Med 1999; 341:1974-1978. Gardosi J: Dating of pregnancy: Time to forget the last menstrual period. 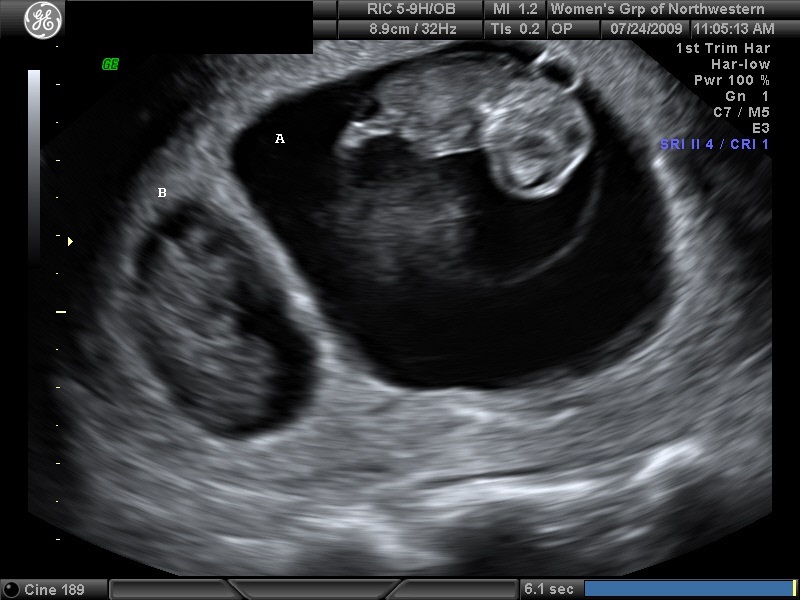 Ultrasound Obstet Gynecol 1997; 9: 367-368. Robinson HP, Fleming JEE: A critical evaluation of sonar “crown-rump length” measurements. Br J Obstet Gynaecol 1975; 82: 702-710. MacGregor SN, Tamura SK, Sabbagha RE et al: Underestimation of gestational age crown-rump length dating curves. Obstet Gynecol 1987; 70: 344-348. Rossavik IK, Torjusen GO, Gibbons WE: Conceptual age and ultrasound measurements of gestational sac and crown-rump length in vitro fertilization pregnancies. Fertil Steril 1988; 49: 1012. Naplitano R,Dhami J, Ohuma EO et al. Pregnancy dating by fetal crown-rump length: a systematic review of charts. BJOG 2014; 121:556-665. DOI:10.1111/1471-0528.12478. 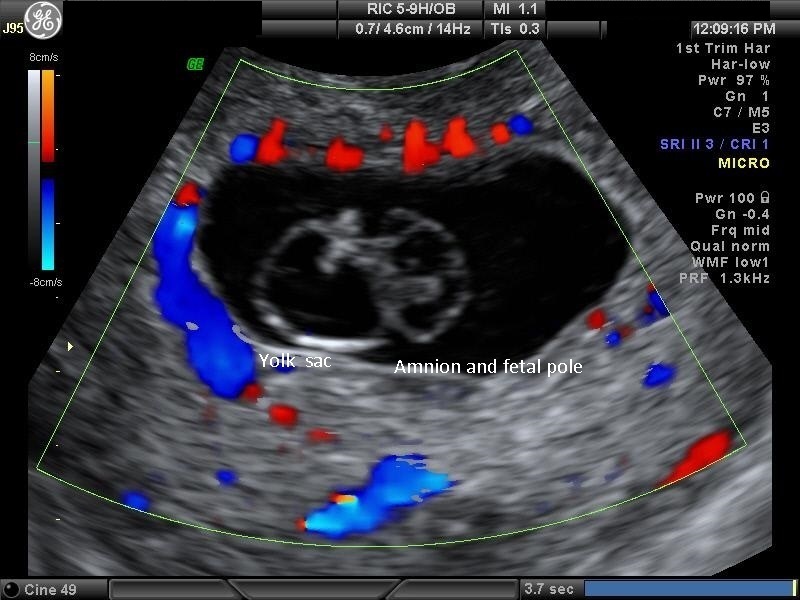 Monteagudo A, Timor-Tritsch IE, Sharma S: Early and simple determination of chorionic and amniotic type in multifetal pregnancy in the first fourteen weeks of pregnancy by high frequency transvaginal ultrasound. Am J Obstet Gynecol 1994; 170: 824-829. 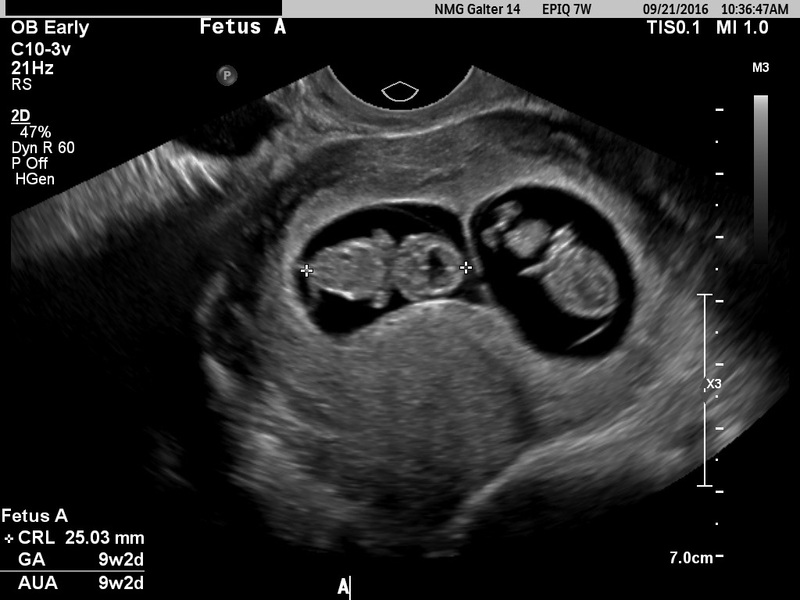 Sepulveda W, Sebire NJ, Hughes K et al: The lambda sign at 10–14 weeks gestation as a predictor of chorionicity in twin pregnancies. Ultrasound Obstet Gynecol 1996; 7: 421-423. 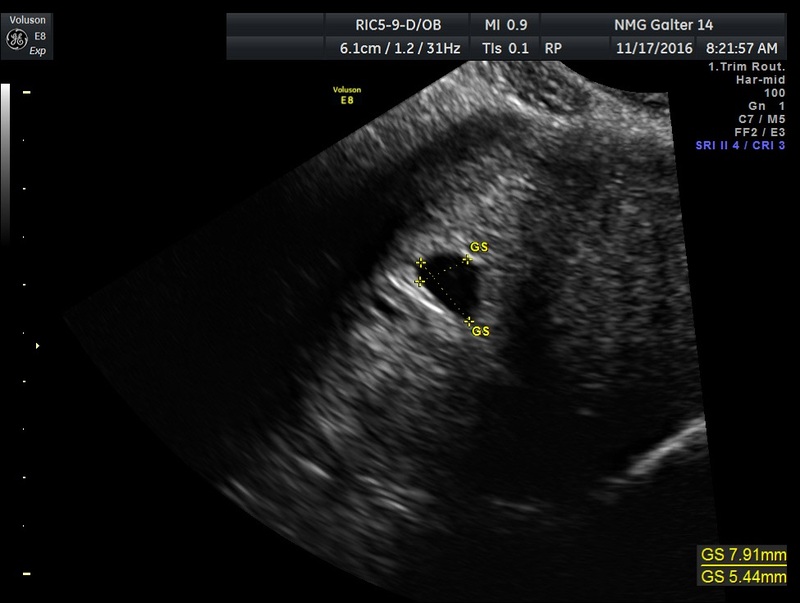 Sepulveda W, Sebire NJ, Psarra A et al: Prenatal detection of chorionicity of triplet pregnancy by ultrasonographic examination of the ipsilon zone. Obstet Gynecol 1996; 88: 855-858. 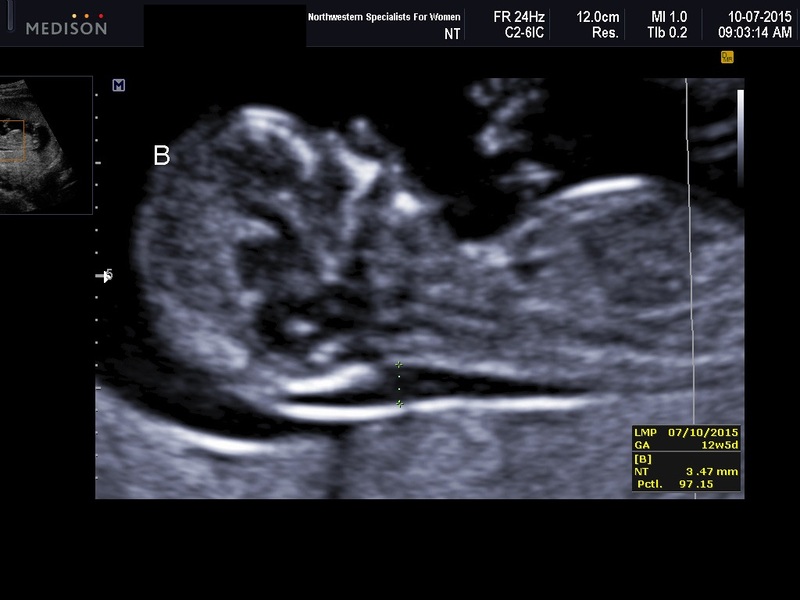 Pandya PP, Snidjers RJM, Johnson SJ et al: Screening for fetal trisomies by maternal age and fetal nuchal translucency at 10 to 14 weeks gestation. Br J Obstet Gynaecol 1995;102: 957-962. 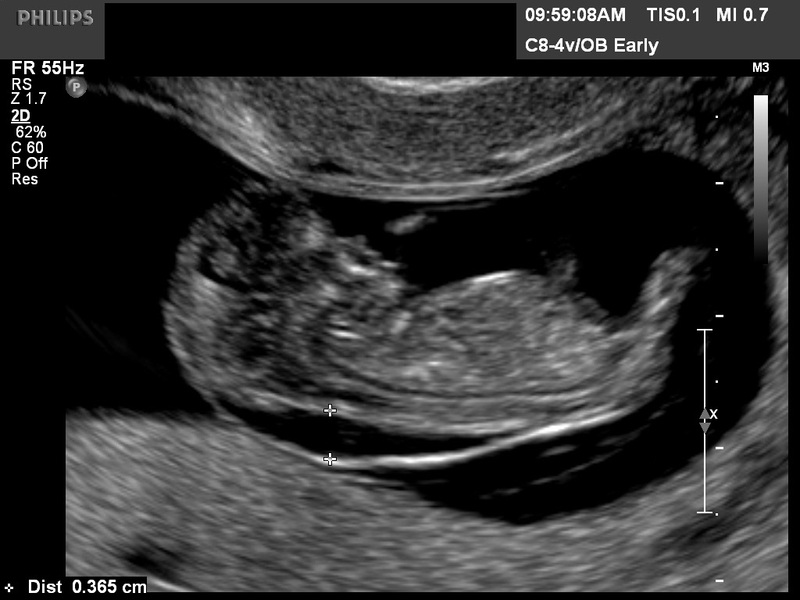 Orlandi F, Damiani G, Hallahan TW et al: First trimester screening for fetal aneuploidy: Biochemistry and nuchal translucency. Ultrasound Obstet Gynecol 1997;10: 381-386. Braithwaite JM, Kadir RA, Pepera TA et al: Nuchal translucency measurements: Training of potential examiners. Ultrasound Obstet Gynecol 1996 ;8: 192-195. Norton M.E., Jacobsson B., Swamy G.K. et al. Cell-free DNA analysis for non-invasive examination of trisomy. NEJM 2015; 372: 1589-1597. Reiff ES, Little SE, Dobson L, et al. What is the role of the 11 – 14 week ultrasound in women with negative cell-free DNA screening for aneuploidy? Prenat Diagn; 2016:36:260-265. 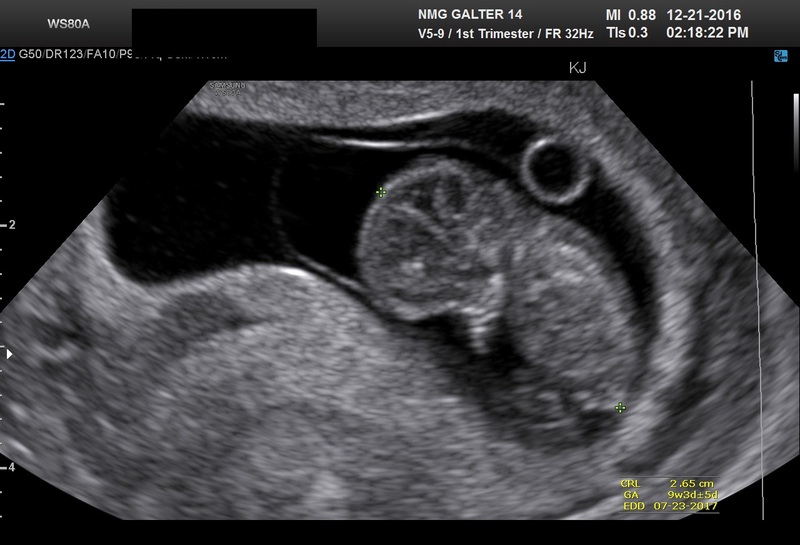 Souka AP, Nicolaides: Diagnosis of fetal abnormalities at the 10–14 week scan. Ultrasound Obstet Gynecol 1997;10: 429-442. Rossi AC and Prefumo F.: Accuracy of ultrasonography at 11-14 weeks of gestation for detection of fetal structural anomalies: a systematic review. 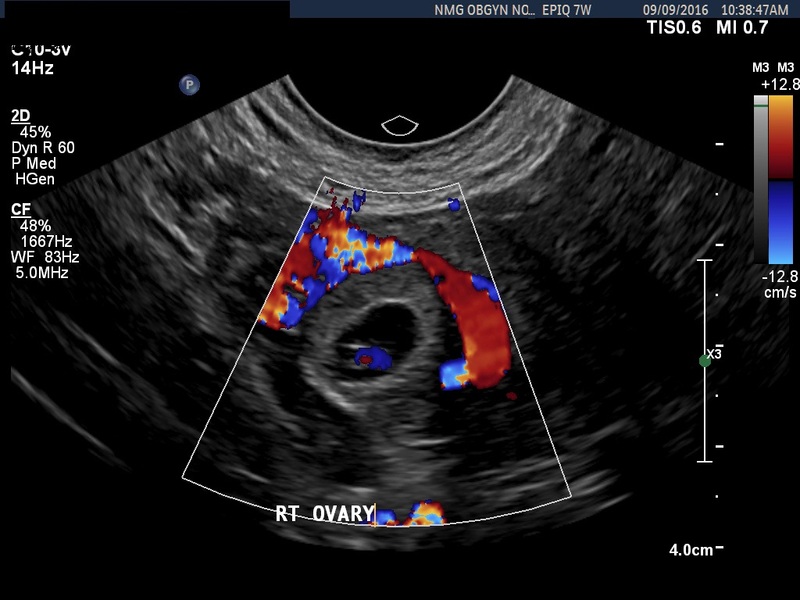 Obstet Gynecol 2013 ;122:1160-1167. Syngelaki A, Chelemen T, Daklis et al. Challenges in the diagnosis of fetal non-chromosomal abnormalities at 11-13 weeks. Prenatal Diagnosis 2011;;31:90-102. Iliescu D, Tudorache S, Comanescu A et al. 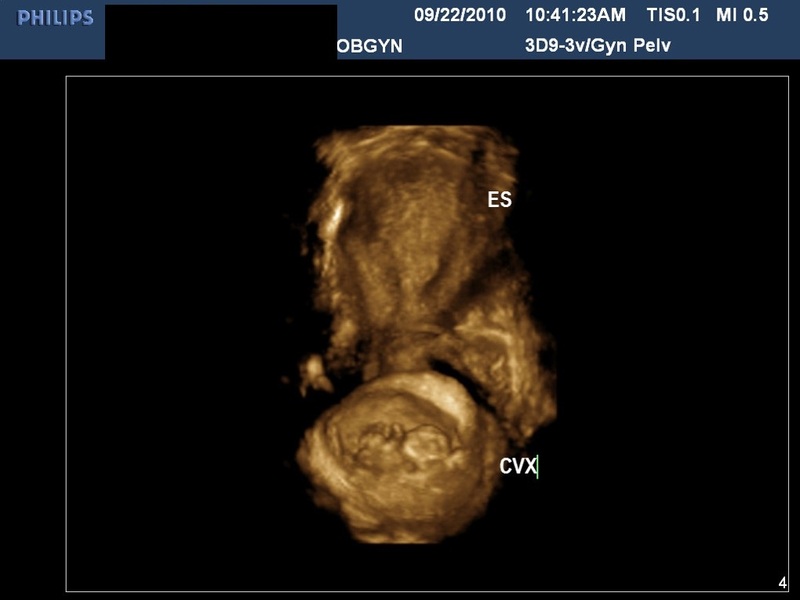 Improved detection rate of structural abnormalities in the first trimester using an extended examination protocol. Ultrasound Obstet Gyneco 2013l;42:300-309. 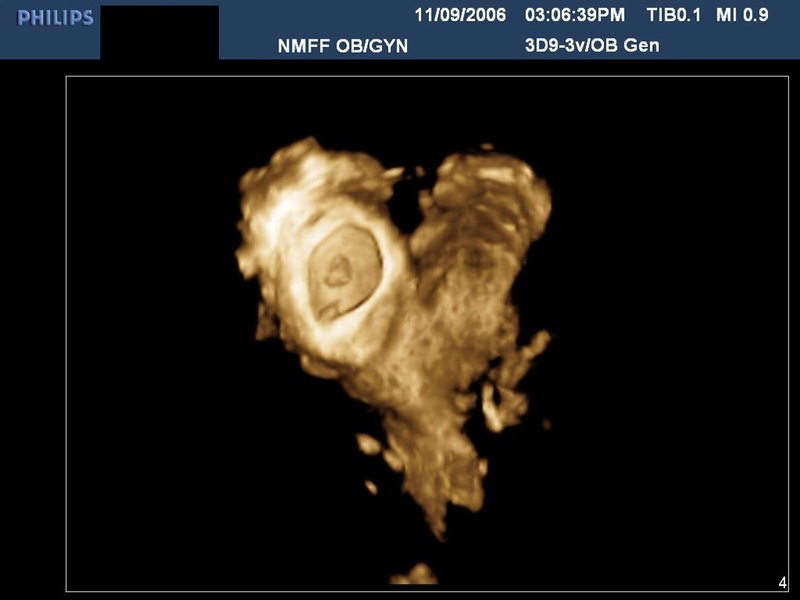 Hyett J, Moscoso G, Papapangiotou G et al: Abnormalities of the heart and great vessels in chromosomally normal fetuses with increased nuchal translucency thickness at 11–13 weeks of gestation. Ultrasound Obstet Gynecol 1996; 7: 245-250. Simpson L, Malone F, Bianchi D et al: Nuchal translucency and the risk of congenital heart disease. Obstet Gynecol 2007; 109: 376-83. 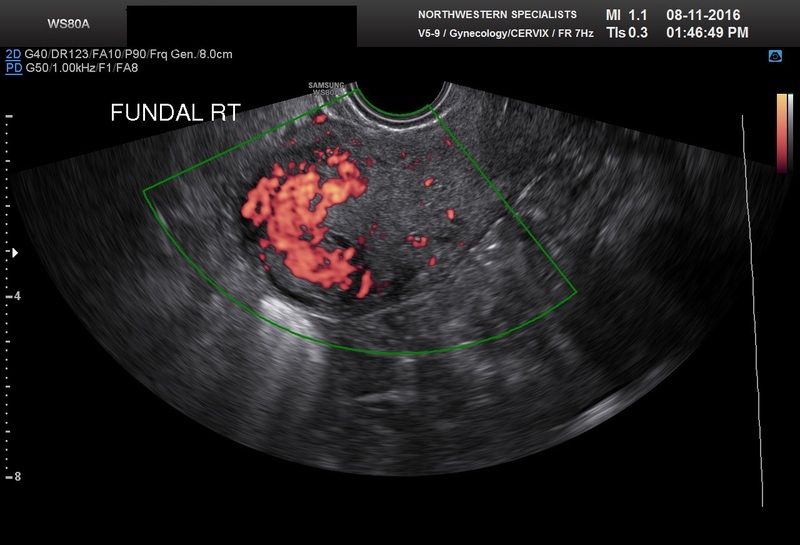 ISUOG Practice Guidelines: performance of first-trimester fetal ultrasound scan. 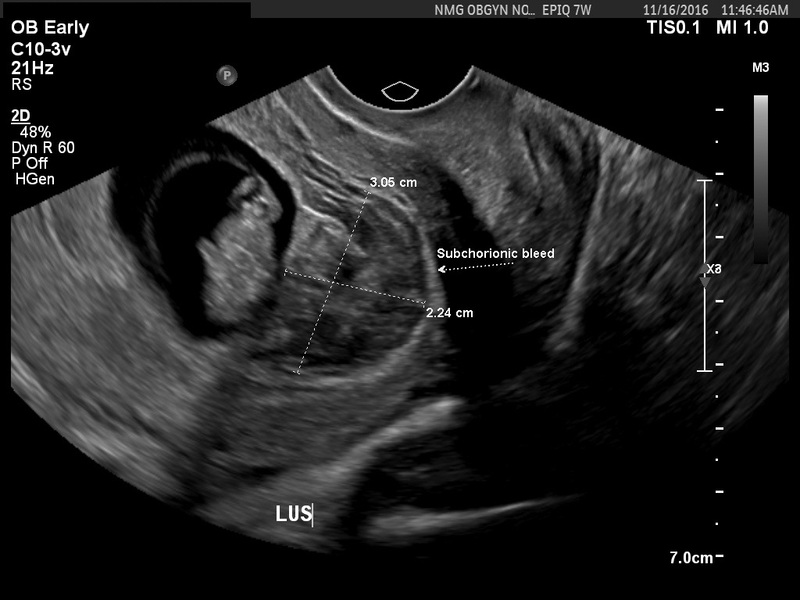 Ultrasound Obstet Gynecol 2013;41:102-113. 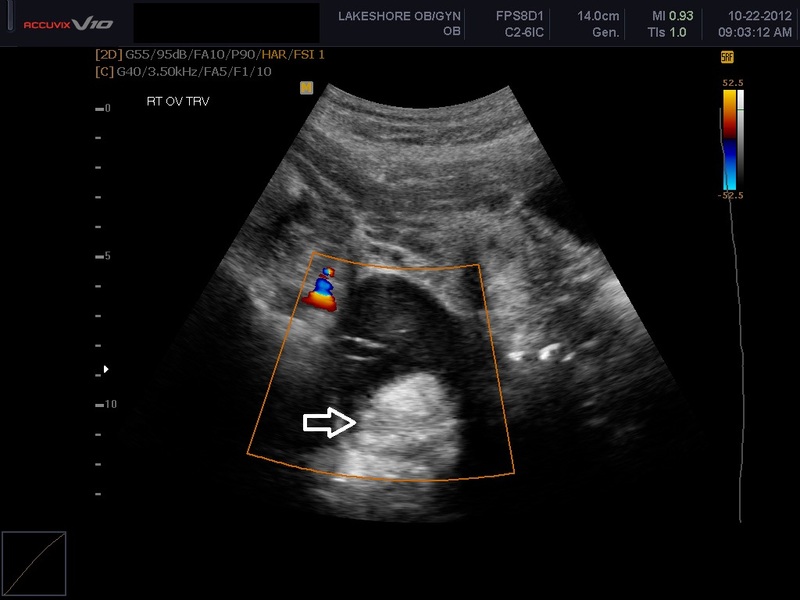 Yagel S, Achiron R, Ron M et al: Transvaginal ultrasonography at early pregnancy cannot be used alone for targeted organ ultrasonographic examination in a high risk population. Am J Obstet Gynecol 1995; 172: 971-975. Timor-Tritsch IE, Bashiri A, Montageudo A, Arslan A. 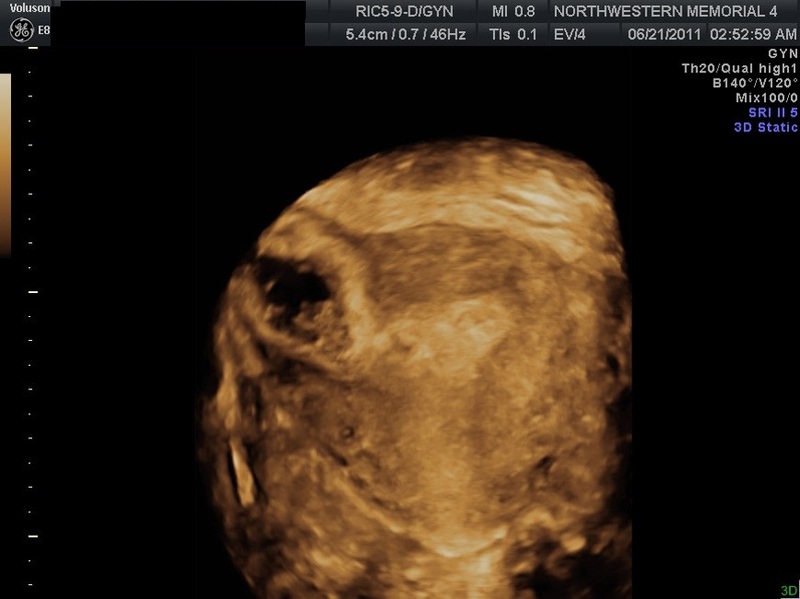 Qualified and trained sonographers in the US can perform early fetal anatomy scans between 11 and 14 weeks. Am J Obstet Gynecol 2004; 191: 1247-52. 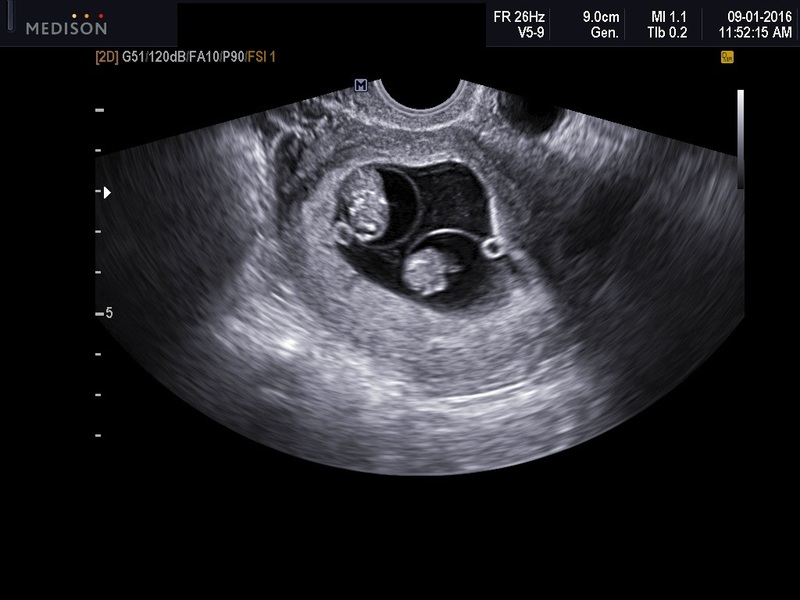 Fishman DA, Padilla L, Keh P et al: Management of twin pregnancies consisting of a complete hydatidiform mole and normal fetus. Obstet Gynecol 1998; 91: 546-550.